Injuries are a major public health concern that affects all Iowans, regardless of age, race, gender, or size of county. However, the distribution of the cause, intent, and type of these injuries varies greatly throughout the 99 counties of Iowa, depending on their population demographics and other factors. In 2008 the UI IPRC partnered with the Iowa Department of Public Health (IDPH) to produce Iowa’s first Burden of Injury in Iowa report, and did so again in 2016. The reports provide statewide rates of injury death and non-fatal events for all types of injuries, as well as county level reports. 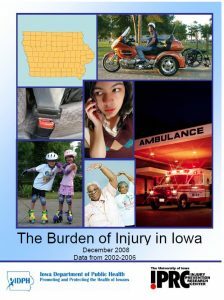 The Burden of Injury in Iowa report has been used extensively by both local health departments and agencies to prioritize injury programs and promote the need for injury prevention throughout the state. The UI IPRC also contributes injury data to the Iowa Health Fact Book.